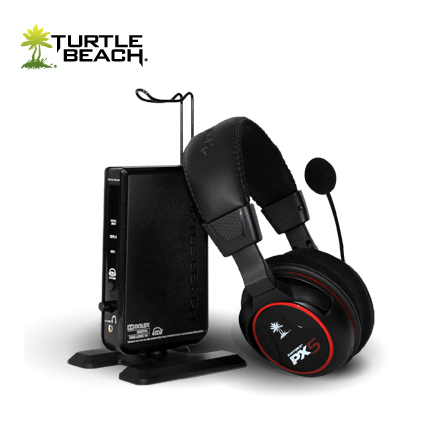 he Turtle Beach PX5 is the most technologically-advanced headset ever designed for PS3 and XBOX 360 gaming, incorporating a programmable digital signal processor to allow independent customization of the chat, game and microphone signals. Custom presets stored in the Turtle Beach PX5 headset can be selected during specific parts of the game to emphasize sounds like footsteps or reloads that might otherwise be difficult to hear. It can even be programmed to disguise your voice or to enhance the voices of online players so you can hear them more clearly during intense parts of the game. The Turtle Beach PX5 is also the first headset to incorporate dual radios—one for immersive, Dolby Digital surround sound game audio and another for chat on the PlayStation Network via Bluetooth. The Bluetooth feature also supports stereo audio streaming for listening to music while playing a game and can also be used to accept phone calls while playing the game. Although optimized for PS3 and Xbox 360 gaming, the Turtle Beach PX5 is also perfect for watching movies and listening to music, with its impeccable audio performance, large, deep, fabric cushions, soft headband, and twist cup designed for resting the headset on your shoulders. The Turtle Beach PX5 marks the beginning of a new breed of wireless gaming headset that serves as the ultimate “secret weapon” in the arsenal of serious gamers seeking unmatched audio quality, sonic control and a competitive advantage.